Thanks to some very helpful comments on the last post and some example code I was able to see what I was doing wrong with bidirectional communication. I'd tried to use hGetContents and just read off one message at a time. This is doomed to failure because laziness and hanging around on a network socket that's in a semi-closed state just isn't going to work. In this version of the code we enter a loop which terminates once the client sends the "quit" message (rather than an infinite loop). sendFrame h "hi, remember you can stop this at anytime by pressing quit!" readFrame h = readUntil h ""
On a side note - the indentation for the if/then/else is a little strange, but "if within do" at least explains why. All that remains is a quick bit of HTML to allow you to have a conversation. Replace the body in the previous example with something like this (and also make sure that the ws object has the appropriate scope! You should get something where you can have a rather boring conversation with Haskell. 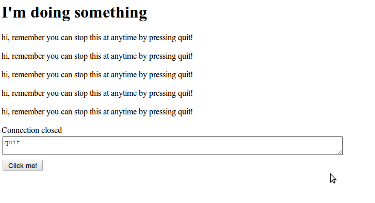 It repeats the same text over and over again until you press quit.